Trying to setup Google Analytics on your website? If you’re completely new to Google Analytics and need help from start to finish, here's a step by step guide to help you get set up in 5 easy steps. And if you get stumped by any Google Analytics (GA) jargon along the way, feel free to refer to the terms glossary we included below. Feel free to follow along as you start your Google Analytics account for the first time. Since all Google services like Google Drive, Google Calendar, Google+, or YouTube are connected to one Gmail account so is your Google Analytics account. Ensure that when you sign up for your Google Analytics account you're using the email that you want it to be associated with it. You’ll have to keep using that email to access data from your Google Analytics account. After you click the Sign-Up button, you fill out information for your website. Pro Tip: If you plan to let an agency handle your Google Analytics it’s best to create your account for yourself and then just grant them access. The last thing you want is someone to create an account for you with their Gmail account and then leave with all your website data, never to see it again. This happens a lot more than you think. Google Analytics accounts are based on hierarchies systems so you can organize your account better. 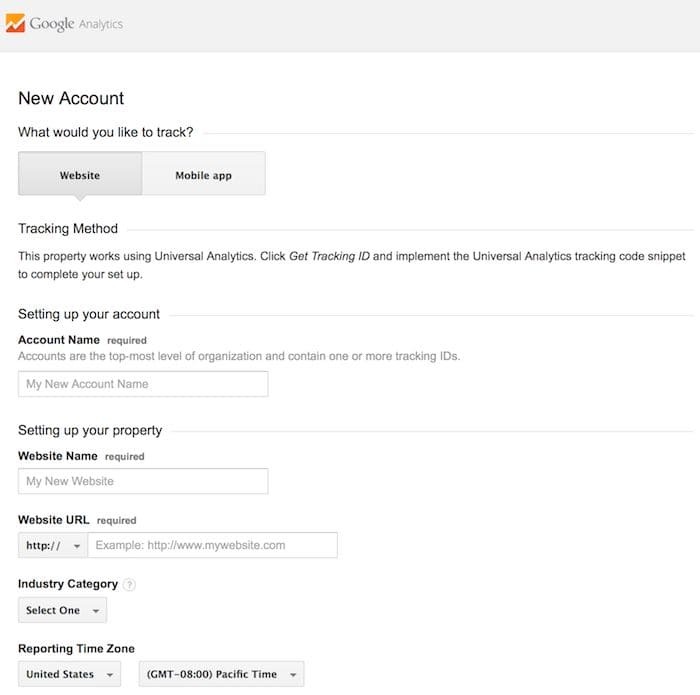 You can have up to 100 Google Analytics accounts under one Google account. Plus add up to 50 website properties under one Google Analytics account. You can have up to 25 views under one website property. Below you’ll be given the option to decide how you want to collect, process, share or store your Google Analytics data. Check all the boxes, even if you don’t plan to use them now, later on, they may be helpful to your GA account manager. Pro Tip: If your going to rely heavily on Google Analytics, or have a profession in it, having the mobile version on your phone is a plus. You can keep track of campaigns and goals. 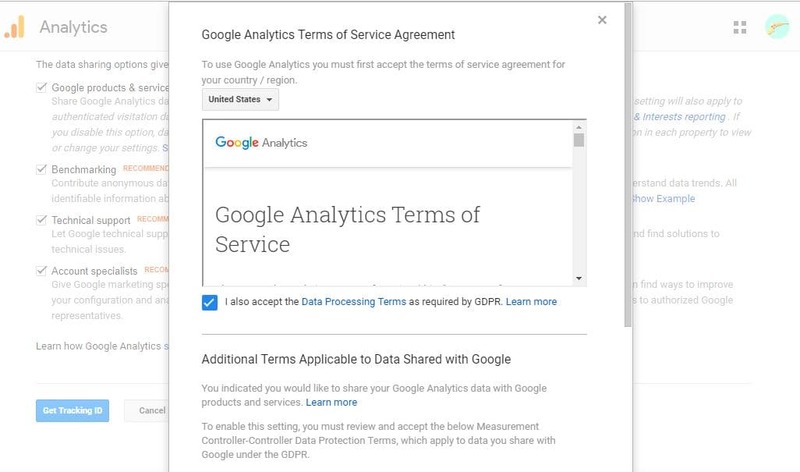 Once you’ve finished your sign up you’ll have a list of Google Analytics terms and conditions to agree to. After you’ll be taken to the ADMIN section of your account where you can view your Tracking ID and Website tracking code to install in your website/blog. You’ll be using this so that Google Analytics can track and collect your website data. Don’t worry, it’s not as complicated as it sounds. If you’ve already created your GA account or accidentally left this page, that’s okay, you’ll always have access to your tracking ID and code in the ADMIN section of your account. Look on the right side of your Google Analytics dashboard and click the gear icon for the setting. View the “Property” Section on your ADMIN page. Now you know how to find your Google Analytics Tracking ID and Website Tracking Code, it’s time to put that code to work on your website. Not everyone uses the same website builder or online platform so knowing how to install your code depends on what type of website you have. Below you’ll find tutorials for your platform. If you plan to use more than one site for the same brand or business then you may want to have separate codes to track your data properly. Once you’ve successfully installed your Google Analytics tracking on your website give it some time before you to start seeing reports and data displayed on your Google Analytic dashboard. Pro Tip: You can also use plugins to install your Google Analytics tracking code for Shopify or Wordpress so it’s easier to manage. If you have problems connecting your website and Google Analytics account your plugin can help to fix the problem. Now that you’ve successfully installed your tracking code on your website or online store you can move on to one of the best things about Google Analytics...Goals. What’s so important about goals? Google Analytics goals and events help you to track only the data you want to track your marketing campaigns or customer conversions. With Google Analytics you can create specific goals to track. Google Analytics allows you to track goal conversions so you can determine how or what’s preventing this goal from being accomplished. Let’s say you want to track how many people successfully download your ebook. Setting a goal helps you to see which pages people exit before completing the goal or how many people actually complete the goal can give insight on how to improve. There are four categories of goals you can create with Google Analytics. Revenue: these are goals that are related to purchases or revenue, like completing a product purchase on your online store. Acquisition: create goals related to creating leads and completing sign-ups on specific pages. Inquiry: track your business request like a sample, contact info or filling out forms by making them goals. Engagement: create goals that, when completed, are related to elements on your site, like video, media, etc. Custom: creating your own custom goals. Pro Tip: You can create up to 20 goals per view in your Google Analytics account. So try to use your views and goals wisely before you run out. It’s always best to ensure that your views and goals align with each other. Now that we know how great goals can be, it’s time to create your own! Go to your ADMIN icon on your left side, then look under the “View” section and listed below select “Goals”. Then you’ll be taken to a page where you’ll see the option to create a “New Goal”. Whenever you create goals this is the section they’ll all be located. You can always edit or delete them in the future so you won’t be stuck with goals you don’t want. Google Analytics gives you goal templates you can use to create a specific goal. You do have the option below to create a custom goal for your website but if you’re new to Google Analytics it’s always best to stick with the basics for now. That’s the URL you want to add to this section below. Anything else and you’ll end up tracking the wrong page or nothing at all. The next task to complete setting up your Google Analytic account like a pro is Site Search. If your website has a search box, and most websites do, setting up Site Search report from your Google Analytics is one of the most valuable reports you’ll use. Site Search report helps you to see the keywords and pages visitors are using on your site to find the things they want. You can only access this information after setting up Google Analytics Site Search for your website. You’ll be taken to the Basic Settings, from there go ahead and grab your site’s URL and place in the form below. Be sure to leave off the “https://” or it won’t work. Then scroll down to SIte Setting until you see Query Parameters, this is usually an s or q. To find your website query parameters take your website URL and Google it. Look in the URL and see if there’s "a" "s" or "q". Take a look at the example, when I googled Google the query parameter was q. Then place your s or q in the Query Parameters section and turn on Site Search Tracking. Now you’re good to go. Pro Tip: You can use your Site Search report to create targeted marketing campaigns to increase sales or traffic. Let’s say you’re a book company and you’ve noticed visitors are searching for a specific book on your site. If you don’t have that book, you can order it knowing it’s in demand, if you do have that book you can start doing ads to let people know your online store is the place to get it. Now that you’ve got your Google Analytics up and running, somewhere down the line you’d probably want to share your account info with an expert or add team members to help manage or view specific data. From there you can search, add and edit access to the emails of the persons you want to add to your account. You can also remove person’s once you’ve finished giving them access. At first, it can be a bit confusing, you’re probably wondering which reports using, what data matters, how do I even create a custom report. So I’ve created a list of the most used Google Analytic reports. These are the reports you’ll be using the most, based on what your goals are. Acquisition: this report shows where your website traffic comes from, traffic from search engines, social media, email marketing campaigns and links from other websites. Located under the Acquisition tab. Keywords: we all know how powerful keywords can be. Your keyword report tells you what words visitors search and use to find your website and with what search engines like Google, Bing, Firefox. Located under the Behavior tab, under Site Search. Conversions: this report helps you to track visitors who have turned into customers, subscribers or even community member sign-ups. Located under Conversions tab and select a specific of conversion report you’d like to see. Lifetime value: one of the most undervalued report, despite the name. This report provides data on first-time visitors conversions, return visits, future purchases and more. This can help you to understand your buyer behavior to turn them into lifelong customers. This can help you figure out what turned these visitors into customers and what made them keep coming back so you can implement changes. Located under the Audience tab. Landing page: use this report to know which landing pages on your website are visited the most. You can see where they're coming from and what’s on your page making them stay. Located under Acquisition, under the Search Console. You'll find this across different reports under the landing page column. If it's not enabled you'll see a message like the one below. Active users: this report gives you data on how many visitors are actively on your page at a specific time frame, for example, active users within the last 7-days or month. You can use this report to see which pages visitors leave or stay on to learn how to keep them on your website longer. It’s located in the Audience tab under Active Users. Now that you have the basics down, here's more on using Google Analytics as a small business. Pro Tip: To get the most out of your reports you can also use Google Tag Manager (GTM). It connects to your Google Analytics account and sends information when a specific URL or GTM script is triggered. it's highly recommended to use both Google Analytics and Tag Manager you get a better look at your data plus it can be used for more advanced tracking as your site grows. Pro Tip: You can use Google Analytics URL Builder to track your links in Google Analytics. You can also create custom links for your marketing campaigns and more so you identify which pages or platforms are popular with your customers. Now that you have your Google Analytics account started let’s say that you’ll probably be too busy to check your Google Analytics account every day. Or you’re not a big fan of Google analytics for whatever reason but you still need access to your website data. Take a look at the best tools that can help you get more out of Google Analytics in less time. Quill Engage: One of my personal favorites. Quill sends you easy to understand reports on your site performance. Quill Engage will do an analysis and deliver the most important insights from Google Analytics emailed right to your inbox. So you don’t have to check in every day. You can also customize how often you want reports so you’re not overwhelmed. Cyfe: You can create dashboards for your site with widgets like Facebook, Google Analytics and more for all your websites or online platforms. Segment: Segment takes your customer data and managing your analytics, marketing, sales, support, and testing platforms so you know what’s working from what’s failing to bring results. It’s a lot to take in when you just start using Google Analytics, but the more you use it the more comfortable you get with it. You can also take online classes or get certified for Google Analytics to help deepen your understanding. Account: an account is where a property is kept on your dashboard. You can multiple properties in one account or create multiple accounts with different properties. An account can have up to 50 features. Property: A website, blog or mobile app you want to track is called a property. Views: This allows you to access, customize, and analyze your data. A view allows you to “view” reports and analysis tools. You can create customized views or give persons access to specific views. Tracking ID: this is a unique ID or code you add to your site that allows Google Analytics to track it. Each Tracking ID is unique to every account. Channel/Traffic source: the term is used to help you know where your visitors are coming from, such as referrals or links from other sites, search engines, social media, and emails. Session duration: how long visitors spend on your site or specific pages. Bounce rate: the percentage of visitors that view only a single page. Event: this is a specific behavior or task done by a visitor, example a customer adding an item to their cart or downloading a file is an event. Landing page: the first page a visitor sees when they click on a link to your website link. Segment: as the name states it’s a segment or category of filtered information. For example, you can create a segment if you want to know who many visitors using a mobile vs. desktop.